Santa brought my daughter this really fun toy called The Mega Ice Cream ball. She had her eye on it for a while and I was not sure if the thing really would work. We tried it twice and it worked both times, and the ice cream was really great! The premise is that your child and siblings or friends roll the ball around back and forth for about 30 minutes. The shaking of it with the freezing ice surrounding it creates ice cream in the central container. We really have enjoyed this gadget. Here is what I like about it. It gives the kids some exercise. It keeps them away from the TV. You get enough ice cream to save in the freezer for later. Use it outside in the summer or inside as something physical to do in the winter months. Roll it on a carpet. 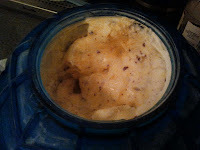 We tried a couple of recipes and approaches, and we found that the Ben and Jerry's recipe base is a creamier ice cream, being able to be stored in the freezer better. Unfortunately, this is the higher fat version. It is very good, almost like Haagen Dazs. We tried a version with lighter half and half with no eggs, and it was good. But it became icy as we tried to store it for a few days. Here is a picture of the half and half mix so you can see. My daughter still enjoyed it. This was a "hot cocoa" ice cream. using 4 packets of instant hot cocoa inside the half and half. Hot cocoa with half and half. See the ice? More water, more iciness. Less creamy. Below is the recipe we made that I highly recommend. It does use egg and full cream, but it is oh so good. Supposedly you can make a sorbet with the ball as well. We will give that a try soon. 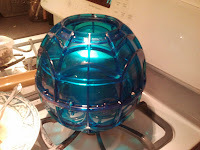 If you are a mom trying to figure out a way to keep the kids moving and distracted from video games and the TV this winter, this funky ball will help. It helped me! In the bottom of the ball, fill with ice and add the salt. Tighten cap with the tightener provided. Turn over and uncap the ice cream receptacle. In a bowl, whisk the egg until it is foamy and fluffy, about 2 minutes. Add the 3/4 cup sugar, 1/4 cup at a time, whisking really well after each addition. Add the cream and milk, whisking until well combined. Add the vanilla and whisk again. Pour into the container. Finely chop the chocolate. Add the chocolate to the container and mix. Put the cap on and tighten with the tightener gently. Roll the ball around, shaking and tossing and rolling for 15 minutes. We set a timer, tell jokes or take turns playing I spy as we roll back and forth. My daughter came up with wearing mittens as we do this, because the ball gets very cold and hard to handle. When the timer goes off, uncap the ice cream with the tightener, and scrape the sides with a plastic spoon or wooden spoon, mixing the solids with the liquids. Cap tightly again. Turn the ball over and uncap the ice opening. Drain off the water, using the cap to block the ice from falling out. Fill with more ice and add 1/3 cup more salt. Cap tightly again, and shake again for 15 more minutes. Your ice cream is done! 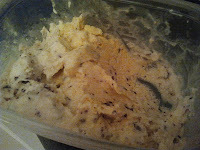 Scrape out the ice cream and store in an air tight container. Try not to use a hard metal object in the ice cream container, it will scratch. Use plastic, wood or rubber.